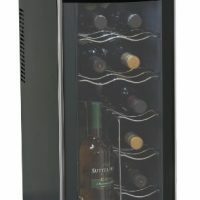 With an Avanti WCR682SS-2 series of latest wine cooler, it is now possible for the wine lovers to let their wines stay at a steady 54 degree temperature that keeps them cool and yummy. As it comes to your accommodating need; the company offers you room to store 160 bottles of wine inside. However, you are expected to keep the bigger bottles like Champagne in either of the top or bottom shelves that are larger in height. Yes, all the rest shelves are designed for preservation of the standard 750ml bottles. Naturally, in order to keep your bigger size bottles safely in Avanti 166 bottle freestanding wine refrigerator, choose only the upper or lower most shelves so as to pull them out become hassle free. Aesthetically, the metallic body concept has not only made it durable but also elegant and glamorous for your wine room. Also, the wooden shelves on pull out rollers show the elegance of this wine cooler. With a product dimension of 71″ H x 23.5″ W x 28.75″ D (with handle) and 227 pound weight the seller prefer to ship the cooler directly to your home. Shipping generally takes 2-3 days by a reputable courier company to assure safety of the product. In conclusion, this stainless steel wine cooler door will look excellent in most home settings! Ease and best preservation of wines with ‘Wine-type-specific’ adjustments. First of all, the installation process requires no special expertise. All you have to do is to take away the packing materials and make use of two screws supplied separately to attach the handle. Now, simply by plugging the cooler, you can get your system ‘on and running’. Also, this wine refrigerator is capable of having the door hinge reversed. A few simple steps will guide you through the process of changing the hinge side of this wine chiller. Apart from the price tag, temperature control and easy to use mechanism; the after sales support of the company as well its channel partners are highly noteworthy. Right combination of features and price for large collection of wine. 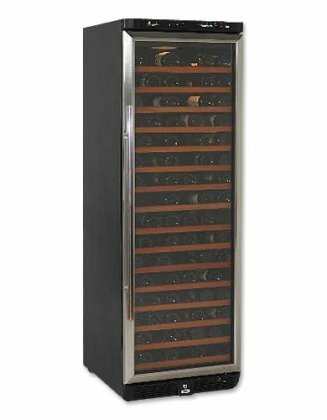 Choose this wine cooler if you need to store more than 100 bottles of wine. Remain relatively silent, which is absolutely not noticeable. The spacing between shelves other than the topmost one is not suitable to accommodate bottles having larger size including Champagne, Pinot Noir or Turley. The company offers a standard depth of each shelf, which is adequate to store usual bottles. However, for some non-standard tall bottles, you may face difficulty to fit them.